Bedford County government offices are located at 200 South Juliana Street, Bedford, PA 15522; phone: 814-623-4811. The Scotch-Irish who settled in the Big Cove and Auchwick creek between the years 1740 and 1749 (whose cabins were burned by the Sheriff in 1750), were clearly the first white settlers within the present boundaries of Bedford and Fulton counties. Mr. Adams says a number of Virginians settled In Town Creek valley in 1728 but at that time that valley was within the limits of Maryland. It is also claimed by the present owner of a farm in Bedford township that the Philips house was built and, inferentially, occupied in 1710. This is most certainly an error. Penn landed in the Province in 1682 and the territory of Bedford county was not purchased from the Indians until 1754. There were no actual settlers in Bedford township until 1755. The first trader at Raystown located in 1750. In 1758 a great number of Scotch, Scotch-Irish and a few Germans and Huguenots followed in the trail of General Forbes' army and a great many of them settled in and around Bedford, in Colerain and Cumberland Valley townships, near Schellsburg and on Dunning's creek. In 1762 the industrious and thrifty Germans began to come into the county and with great perspicuity and good judgment settled on the limestone land in Dutch Corner and Morrison's and Friend's coves. Bedford county was originally a part of Cumberland county and was taken from it by an Act of Assembly, passed March 9, 1771. It included all the territory lying west of the remainder of said county and west of the Berks county line as fixed in 1752. Bedford and Fulton counties are enfolded and traversed by the mountains and hills of the great Appalachian system, with the Allegheny on the west and the Tuscarora on the east, and they embosom many beautiful valleys and little canoe-shaped coves which are peculiar to the zig-zag mountains of central Pennsylvania. From the crests of these elevations the scenery is grand beyond description and the views are wide and extensive. The lover of nature can overlook the contiguous counties and gaze far down into Maryland, Virginia and West Virginia. Travelers over the United States and Europe say that these counties have the finest scenery in the world. Geologically these counties have the same formations which extend from the Lower or Trenton limestone up to and including the coal measures. The counties are separated by Ray's Hill. The early settlement of the territory ... the Scotch-Irish were the first settlers and that they organized the county. Arthur St. Clair, Bernard Daugherty, James Coulter, William Proctor and George Woods were appointed trustees to purchase a piece of land, in some convenient place in the said town of Bedford, in trust, and for the use of the inhabitants of said county, and thereon erect a Court House and prison. 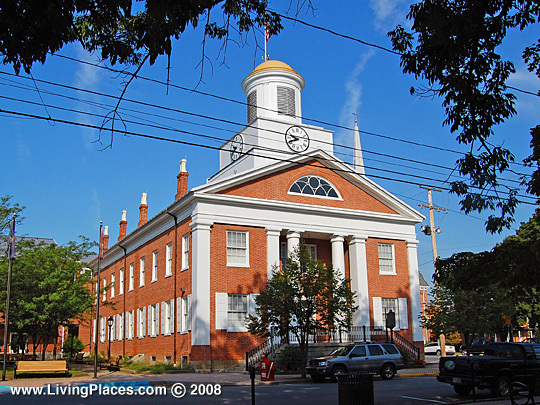 Bedford County Formed March 9, 1771; named by Governor John Penn, in 1776, from fort of this name in the county. Is widely known for its mineral springs. When first established it embraced entire southwest part of the province. Mean altitude 11001200 feet above sea level; in northwest at Blue Knob, near Blair and Cambria County line, is highest elevation in Pennsylvania, 3136 feet above sea level. Surface is broken by parallel ranges of mountains, with narrow, beautiful valleys, in a high state of cultivation. Chief industries are farming, stock raising, and apple growing. It is said that the most important fields of bituminous coal in Pennsylvania are largely in the northeast of this County known as "The Broad Top Coal Fields." Population Scotch-Irish, German, and English. First permanent settlement was made in 1750, by a Scotchman named Ray (McRay), an Indian trader, near present site of Bedford, then Raystown. In 1755, Colonel James Burd was appointed by the province to construct the first wagon road, from Fort Louden, Franklin County, to join Braddock's road near Turkey Foot, Somerset County, passing through Raystown (Bedford), practically identical with the Chambersburg and Bedford Turnpike, now Lincoln Highway. On western border where this road crosses main range of the Alleghenies, at a point two-thirds of the ascent, is a view unsurpassed in the picturesque charm of the landscape, stretching far and wide. The highway follows the main course of the Raystown Branch of the Juniata, crossing this stream at least four times; bridges are iron or old wooden ones. The fort at Raystown was constructed in 1758 by the vanguard of General Forbes' army; it embraced about seven thousand square yards, occupying the bluff now bounded on the east by Richard Street; south, Pitt Street (Lincoln Highway); west, Juliana Street; north, the Raystone River; it was the most prominent military stronghold in the central part of the province, and the principal rendezvous of troops forming the right wing of General John Forbes' army in his expedition against Fort Duquesne, 5,850 men, besides wagoners; largest single contingent was 2,700 Pennsylvania provincials under Colonel Bouquet, who had chief charge of entire force, until General Forbes arrived; the 1600 Virginians were under command of Colonel George Washington and Colonel William Byrd. In 1759, General John Stanwix, then in command of the garrison, had the name changed to Fort Bedford, in honor of the Duke of Bedford; now no trace of the fortification remains. In 1794, Bedford became the headquarters of General Henry Lee, Governor of Virginia, who was commander in chief of the army of 13,000 troops raised to quell the Whiskey Insurrection; President Washington, after reviewing the troops at Carlisle and Cumberland, came to Bedford and made his headquarters in a stone house on Pitt Street, house still standing.